Note: I’ll be at the Society for American Archaeology Meeting in San Francisco for the rest of this week and then in Yucatán and Quintana Roo until the first week of May on fieldwork. I’ll try to get Culture Crime News out during that time but my internet access may be limited. At the very least, Culture Crime News will be back mid-May. General discussion of restitution with Joanna Deakin of the Commission for Looted Art. Brief mention of heritage destruction in conflict in various parts of the world. Fake or not, Monica Hanna asserts that the state should not be so hostile to academic and scientific research. Critisizing the security at Egyptian archaeological and heritage sites. After a wave of vandalism directed at statues and memorials to various South African colonials, the Arts and Culture Minister urges everyone to not break the law, rather decide the fate of the statues via public dialogue. Metal theft has become a major problem in Arusha with monuments and plaques being targeted. On Good Friday a man stole two goblets and a custodia from the María Ministras de los Enfermos in Buenos Aires. The paintings were bought in Brazil 12 years ago by a collectors who didn’t check a stolen art database until a museum required them to. 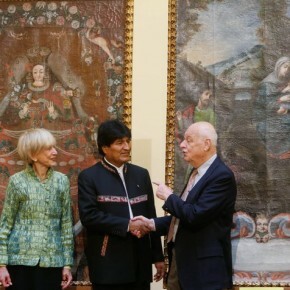 In wake of the return of two paintings stolen from a Potosí church, the Minister of Culture again announced that they will be seeking the return of around 50k Bolivian heritage items in foreign countries. The Church of Saints Cosmas and Damian in Oaxaca, Mexico has installed security cameras to prevent the theft of sacred art. The Public Security Ministry of Oaxaca will be adding cameras to at least 23 churches after 170 thefts in 8 years. A very heavy statue of General Francis de Miranda was stolen from the Chaguaramas Military History and Aviation Museum. There is a fear that the statue will be melted down for scrap. The museum was also robbed of other items in 2013. The statue of Francisco de Miranda that was stolen on 7 April from the Chaguaramas Military and Aviation Museum was recovered along a roadside following an anonymous tip. Repair will be costly. The slow but steady crumbling of the don’t-ask culture around the acquisition of South Asian antiquities in response to Kapoor. LACMA and Norton Simon think that their Kapoor antiquities are clean. Shameful use of ‘primitive’ in title aside. The vandals buried cables and moved artefacts around at the rock shelter in Utah. Authorities are baffled as to why. Should There be a Statute of Limitations on Nazi-Looted Art? This article explores that question based of a statement made in favour of limitation by Klaus Albrecht Schröder of the Albertina Museum in Vienna. A man named Gregg Bemis actually owns the wreck which he bought in the 1960s. He is upset that people are diving at the site illegally while he is not allowed to have people dive and recover items from it. Still dealing with Van Meegeren’s Vermeers. The icon of Saint Nicholas and Saint Spyridon was looted during the Nazi occupation of Greece. Richard Tobin of Glasgow stole £800k worth of Fabergé items from Christies in December 2014. He apparently is no longer claiming to be Lee Harvey Oswald. After having pleaded guilty to the theft of Fabergé items from Christie’s London in 2014, Richard Tobin was sentenced to 28 months in jail. Roberts was working as the countess’ personal assistant when she stole the antiques and art. She has pleaded guilty. The Save Sekhemka Action Group is urging Egypt to get involved as they’d rather see the object go to Egypt than to a private collector. The problem with private collecting of heritage items as exemplified by the sale of a Turing notebook. The items were seized at an auction house and the general implication is they left Egypt post 2011. Australian Indigenous groups are calling for the return of objects in the British Museum exhibition “Indigenous Australians: Enduring Civilisation”. The Valsad rural police arrested a person for a theft at Shri Shankeshwar temple, Bangalore, and recovered two ashtadhatu idols of Lord Mahavir, a crown, and some other ornaments. The accused said he had three other accomplices. Desai asks if Indian objects are better off in western museums. I disagree with both the premise and the details. Three Panchaloha idols of Sri Medha Dakshinamurthy have been stolen from Kasi Viswanath Swamy Temple in Venkatagiri town (Nellore, Andhara Pradesh). The temple is about 300 years old. Someone is throwing oily liquid on a whole host of important buildings and statues in various Japanese heritage sites. An art exhibition by Joy Lynn Davis at the Nepal Art Council, Babermahal, visually repatriates stolen Nepal sculptures. The book is about Admiral Yi Sun-shin (1545-1598) and has been missing since the 1920s. As it turns out, it is sitting in South Korea’s National Maritime Museum. Even though Vietnam paid for the return of the royal rickshaw there is increased hope that they will be able to recover more cultural objects that were lost during times of occupation and invasion. A short editorial in support of various efforts to safeguard heritage in Iraq and Syria. Nemeth is essentially calling out poorly sources rumors about antiquities trafficking and profits in West Asia at the moment. Discussing the protection of heritage with various professionals and the general public in Iraq. Over a month after rumours, this video is out. It is unclear when the footage was shot. They used explosives on the site. The Israel Antiquities Authority found pickaxes and other looting evidence at cave near Kibbutz Lahav. They were able to locate a number of artefacts that the looters missed.